Savlonic are the virtual electronica band dreamt up by Mr Weebl- and while the band may be virtual, the music they produce is legit. Broken is the first track from their new crowd-funded album Neon, and features an ace video from Kreid and Weebl himself. The album is available now. Pokemon Generations is a 100% official web animation series from The Pokemon Company. 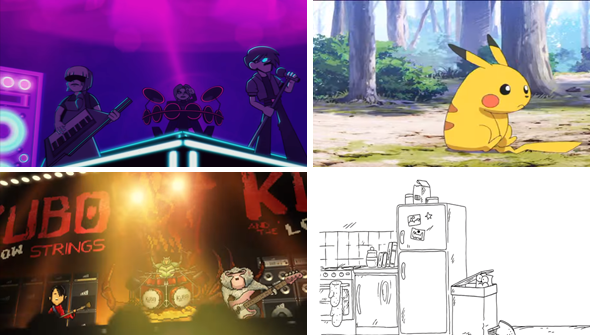 As part of the franchise's 20th-anniversary celebrations a series of new 3-5 minute shorts will be released showing iconic moments from Pokemon's various past iterations. The first three episodes have been uploaded so far. A new episode will be released weekly until December. Kubo and The Low Strings is a pixel-art promotion made for LAIKA's wonderful Kubo and The Two Strings by tea&cheese. Recreating the characters of the movie in 8-bit style was an inspired idea, and this works brilliantly. Sadly, it was never actually used, but at least we get to see it now. If you've created something that might be at home here, be sure to get in touch.